I tend to not follow any specific rules when it comes to designing, it is after all a creative process and rules tend to restrict so for me its a lot more about following my intuition. Having said that there are some guidelines that I follow because I know they will pretty much get me a fabulous result. Over the years I’ve built up a list of what works and what doesn’t a foundation if you will so I thought I would share some of them. When deciding on a paint colour do not decide based on that tiny swatch you see in paint stores. Go test a large wall, a really large wall. You’ll make fewer mistakes that way and if it doesn’t work out you can repaint within the hour! Resist themes, any kind of themes although I have to say beach-y themes for me are the worst. Blue and white nautical palette, shells, sail boats anyone? Â Yuk! Themed rooms lack individuality. That is not to say you cannot be influenced by your surroundings but do it in a more intelligent way with Â less obvious clichÃ©s you will create a far more tantalising space! Focal points. I say this a lot (apologises) but you need three not one. One anchor and your eye goes straight there, three anchors and your eye will dart around the room. More then three then I hate to say you’ve probably created chaos. All rooms need pieces that take the leading role as well as the supporting role – like in films – not everyone can be the star, and yet the stars can’t be the stars without backup! Play around with scale, if everything is the same scale – super boring, if you mix it up you’ll have on your hands Â rooms that look and feel magical. When it comes to oversizing again you don’t want to overdo it otherwise your space Â will feel a little bonkers. Add charisma. You do this by adding something a little unexpected or super cool. 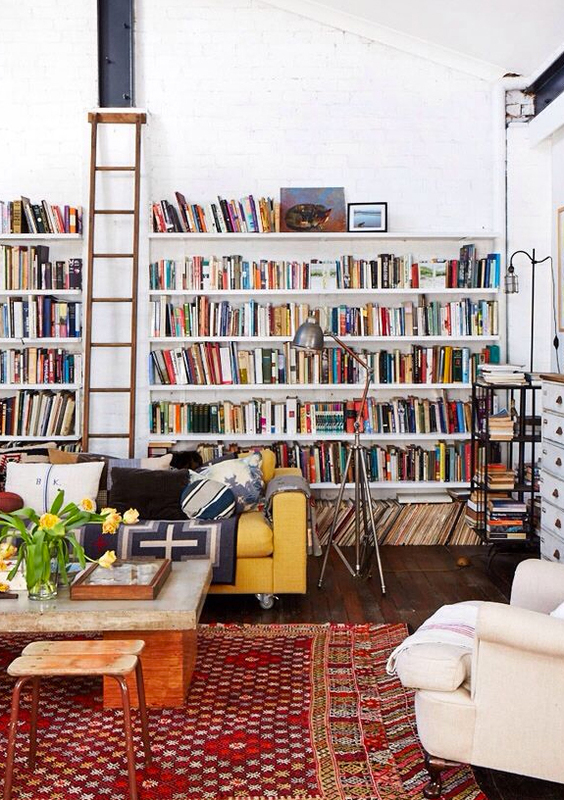 A row of cool shelves like the image below maybe. Or a cool paint colour, or Â chair or ottoman upholstered in a fab fabric, or a fabulous piece of art. Something that takes your breath away. Be a bit haphazard. By this I mean mess things up a bit, ditch symmetry, ditch the matchy look and go for arrangements that feel more relaxed. Do that and you’ll space will immediately feel more comfortable Â and cool! Last piece of advice follow your gut, not your head. Don’t be that practical (practical equals boring just as I was saying in yesterdays post). Don’t think I might move in 2 years so I better not paint. I would paint even if I were moving in 3 months (but I’m a little crazy). Donât think well thatâs all very well but Â I’ve got children so I can’t do this or do that. My sisters and I got brought up in a house full of things, lovely things, but full to the brim. Â Live for now, nobody knows what Â tomorrow brings, so donât hold off, put on the back burner and procrastinate â make it fabulous for now. At least that is my way of thinking!